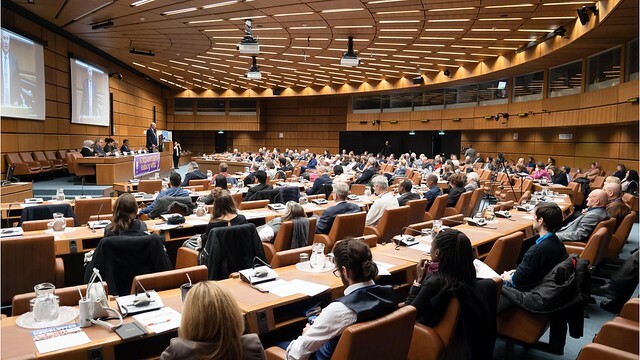 The conference, held on February 1 at the Vienna International Centre (the United Nations headquarters), was attended by 200 participants, including UN diplomats, religious leaders, NGO representatives and other members of civil society. UPF organized the event together with the Austrian chapter of Women's Federation for World Peace (WFWP), an organization that is affiliated with UPF, as well as the United Nations Correspondents Association Vienna (UNCAV-Press), the International Institute for Middle-East and Balkan Studies (IFIMES), and the Best of the World Network. Mr. Jehad Abu-Subhieh, the president of the Austrian-Jordanian Friendship Society (AJFS), began his talk by discussing the pioneering work of the Common Word initiative. Started in 2007, this initiative called for Muslim and Christian leaders to engage in a dialogue based on two common fundamental religious commandments—love of God, and love of one’s neighbor—without compromising any of their own religious tenets. Mr. Jehad Abu-Subhieh added that World Interfaith Harmony Week also extends these two commandments by adding “love of the good,” thereby including all people of good will, including those “of other faiths and those with no faith.” In closing, he noted that H.M. King Abdullah’s strong efforts concerning interreligious and intercultural understanding were honored in November 2018 when he received the Templeton Prize at Washington National Cathedral in the United States. Focusing on Africa, Mr. Jacques Marion, the regional vice president of UPF for Europe, then discussed how immigration from Africa not only contributes to the evolving religious landscape in France but also impacts interfaith cooperation. He said he found it noteworthy that many people in Africa approach this spiritual dimension with an open mind. Mr. Marion concluded by discussing two large summits which UPF organized in Africa in 2018: the first in Senegal in January and the second in South Africa in November. She noted “the rise of parties which do not value these core issues” and called upon religious leaders to provide a response by engaging in interfaith dialogue. Dr. Zadic said she felt intercultural dialogue had been forgotten over the years, even though “it lies at the core of the European Union.” As a human rights lawyer, she said she sees how religion can promote integration, thus preventing marginalization of communities and radicalization. Closing out the first session, Ms. Suad Mohamed, a consultant at the Austrian Red Cross and Diakonie Austria, began by recounting her family's lengthy history of displacement due to war and other security issues. Originally from Somalia, Ms. Mohamed has also lived in Saudi Arabia, Syria, Pakistan, and Austria. She noted three factors that have been important throughout her life. First, belief has made her “stronger and safer.” In that regard, she recalled feeling hopeless when her studies in Pakistan had ended, and it was unclear where she would live next. After crying for divine help, she received the offer to come to Europe three weeks later. Second, Ms. Mohamed spoke about the importance of humanity, giving the example of how an Indian neighbor in Saudi Arabia had shown kindness during difficult times. Quoting Oprah Winfrey, she talked about being the “best version of yourself.” She then discussed the third factor, hope, mentioning that she tries to see the “positive side of each country.” In the face of insults and racism, she shows kindness and never gives up. Ms. Mohamed ended her talk with an excerpt from the “I have a dream” speech of Dr. Martin Luther King Jr. The “Globalization and Interreligious Understanding” session opened with the session chair, Professor Anis Bajektarevic of IFIMES Vienna, introducing the One Book for Peace, an initiative of the Interreligious Council in Bosnia and Herzegovina. Comparing quotes from the Qur’an and the Bible on topics such as justice, love, forgiveness and compassion, the book aims to decrease prejudice and raise awareness of the importance of interreligious dialogue. Ms. Wokusch described the Phoenix Settlement, saying that it has been nominated to be a World Heritage Site. She invited the audience to write a related letter of support and directed them to the Gandhi Development Trust website. Ms. Wokusch also gave background on Mahatma and Kasturba Gandhi, detailing activities connected to the 150th anniversary of their birth and inviting the audience to consider joining the Gandhi 150 Club. The next speaker was Professor Ismail Yasin of the University of Vienna and formerly of the University of Damascus. Professor Yasin noted that we are living in a “critical moment” regarding refugees. Indicating the “moral responsibility” for effective action, he said that countries worldwide have not demonstrated true conviction to take the necessary measures. Pointing out that “since we have had evil, we have had migration,” he expressed doubt that migration will stop. Nonetheless, he said he was optimistic because “falsehood cannot resist the truth.” He called for responsible religious leadership and expansion of the culture of tolerance. Professor Yasin closed by questioning the legacy of the prophets in history, adding that Abraham, Jesus, and Muhammad offered unconditional love to people. He maintained the importance of intercultural and interreligious dialogue in creating lasting peace. Dr. Helga Kerschbaum, chair of the NGO Committee on Peace UN Vienna, began her talk by noting that Buddhism, Christianity and Islam all value benevolence. She observed that with globalization, society needs deeply rooted common values that are “transnational, transethnic, trans-religious, and transcultural.” While indeed such a primary value, benevolence is rarely mentioned in contemporary social discourse, she said. Dr. Kerschbaum noted that peace is a related precondition. Using the analogy of children in a family, she stated that benevolence does not mean equal treatment for everyone but rather an “all can exist well” analogy of individuals receiving specific treatment. Finally, she called for early-childhood education in global peace topics, including skills for better communication. Next, he described serving in Somalia, saying: “Fifteen Muslim clans fighting, proud to have killed women and children in a mosque. Where is the humanity?” Having served in UN peacekeeping missions in Rwanda, he noted that a million people had been killed there. He decried the contemporary crises in Yemen and Syria, calling for humanity to be taught in schools. Dr. Rathor closed by asking the plenary to rise for a moment of silence for those who had been killed. Concluding the conference, Mr. Peter Haider invited everybody to join the activities of the newly established European office of the Interreligious Association for Peace and Development, which is operated in cooperation with Peace Museum Vienna.